Oh, Harry Styles. There are plenty of reasons why we love the Brit heartthrob – from his raspy yet powerful vocals, to his swoon-worthy good looks, right down to his impeccable style and love for Gucci suits. It doesn’t even matter if he’s having a moment with millennial pink or rocking obnoxious polka dots, there’s really nothing the ‘Sign Of The Times’ singer can’t pull off. So what better way to celebrate his 24th birthday than looking back at 24 of his most memorable style moments? Who can resist Harry Styles in his now-signature floral suit? We loved his get-up during his last show here, but this just makes us even more curious what he’d be donning come 3 May 2018! Guess we’ll just have to wait and find out, but meanwhile, don’t forget to get your tickets to his upcoming gig at the Singapore Indoor Stadium – we’re predicting a solid lineup of performances and of course, more outfit changes for your visual pleasure. 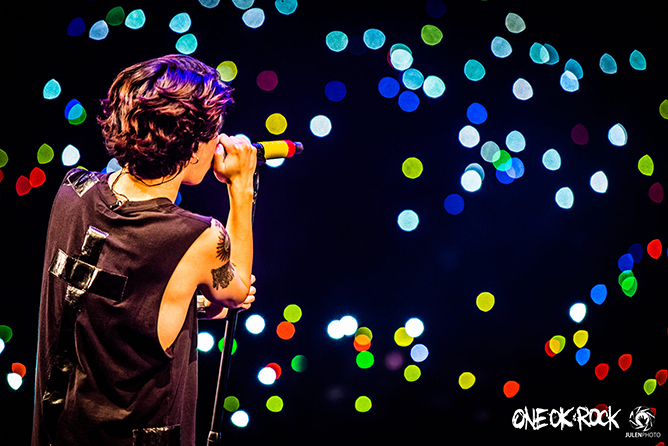 Once again, happy birthday Harry Styles! Hundreds of our favourite artistes gathered in New York City’s prestigious Madison Square Garden for the 60th annual Grammys this year. It was a night filled with jaw-dropping performances, moving speeches and shade-throwing moments. If you’ve missed it, check out our top 2018 Grammys highlights! The night kicked off with an electrifying performance by Kendrick Lamar. Featuring special guests U2 and Dave Chappelle, Kendrick delivered a powerful, politically-charged performance of a multi-faceted medley that included some of his hit tracks from DAMN. 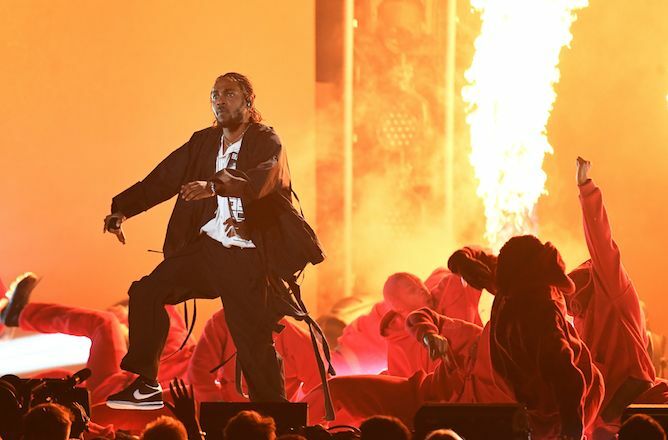 With explosive fireworks, thundering drums and uniformed dancers surrounding him, this performance stood out as, arguably, the best 2018 Grammy performance despite the uber-talented set list for the night. The rapper went on to win five Grammys: Best Rap Performance for ‘Humble’, Best Rap/Sung Performance for ‘Loyalty’ with Rihanna, Best Music Video for ‘Humble’, Best Rap Album for DAMN and Best Rap Song for ‘Humble’. The fabulous duo delivered a phenomenal performance of their groovy hit ‘Finesse’, staying true to the vibrant aesthetic of their hit music video and leaving the audience wanting more. 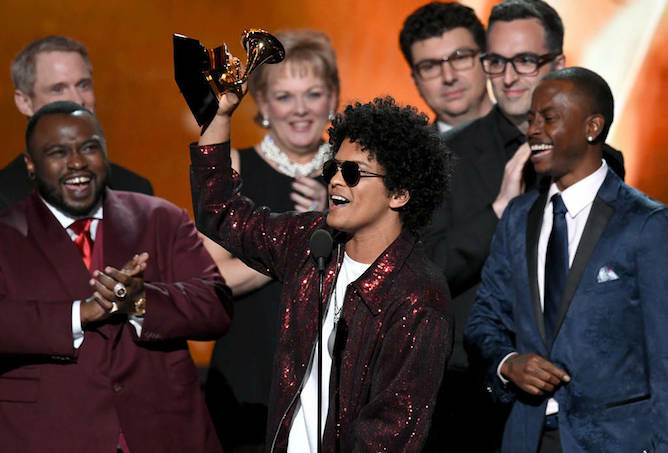 Bruno Mars eventually emerged as the man of the night as he brought home a slew of trophies. The talented hitmaker won all six awards for which he was nominated, even snatching the three most sought-after: Record of the Year for ’24K Magic’, Song of the Year for ‘That’s What I Like’ and Album of the Year for 24K Magic. 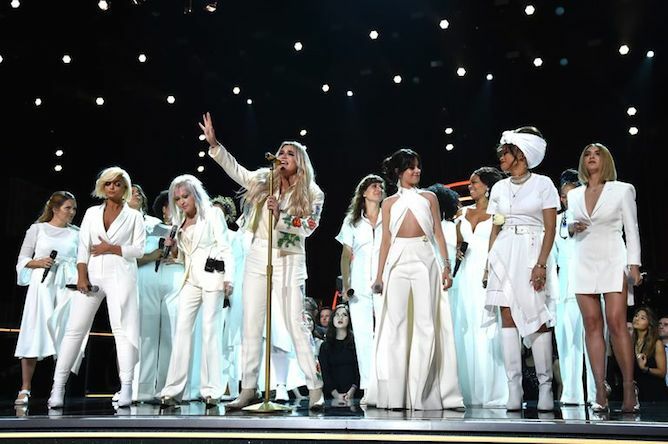 The Grammys was a fantastic platform for musicians to show their support for the Time’s Up movement and Kesha seized this golden opportunity to raise awareness on the matter. 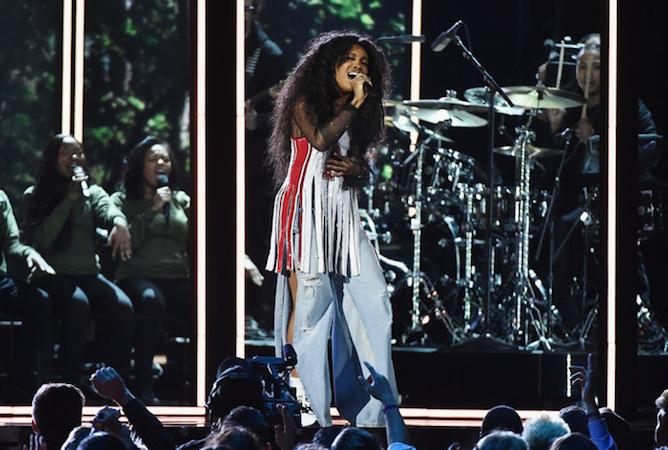 The songstress, joined by notable singers such as Bebe Rexha, Cindi Lauper, Julia Michaels, Andra Day and Camila Cabello, sang a soulful rendition of her chilling anthem ‘Praying’. Introducing the powerful performance, Janelle Monáe urged people to work together to end pay inequality, discrimination, harassment and abuse of power in a well-delivered speech. 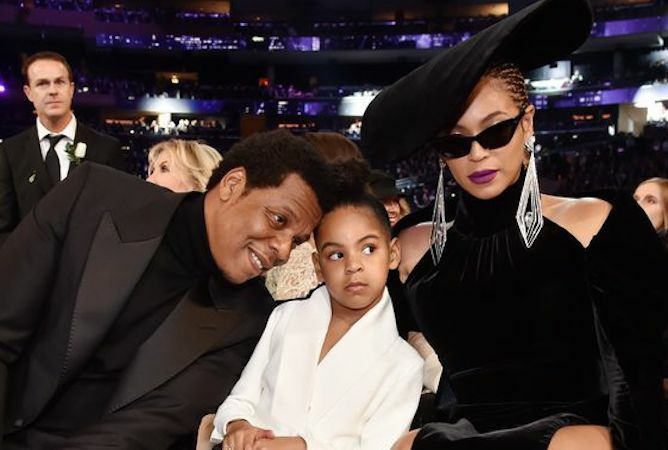 Despite all the excitement and talent on stage, Blue Ivy ended up being the talk of the town as she gestured to stop her folks Beyonce and Jay-Z from clapping during Camila Cabello’s speech. Girl knows some real tea! The Barbados diva wowed the audience when she did the famous South African dance move ‘Gwara Gwara’, while heating up the stage with her smash hit, ‘Wild Thoughts’. The ‘Stay’ singer gave a touching speech after being awarded the coveted title of Best New Artist. “I’ve been pretending to win the Grammys since I was a kid in my shower,” she quipped, before adding on that “there are some incredible artistes out there making incredible music that deserve to be acknowledged”. The equally incredible singer then went on to encourage the audience to “support real music and real artistes because everyone deserves the same shot”. Being up against notable artistes such as Sza and Khalid, however, had its drawbacks. 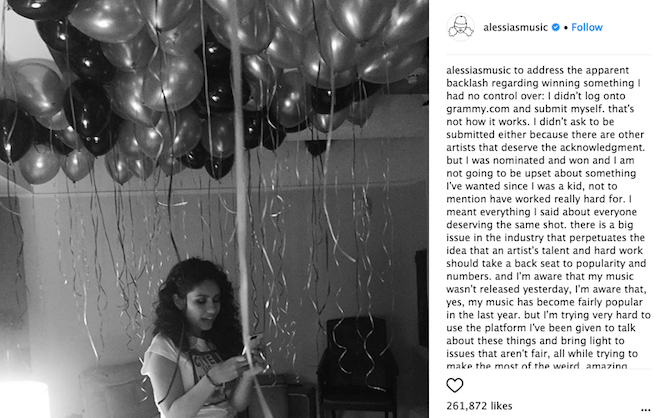 Many took to social media to express their dismay on the chosen Grammys winners and Alessia was unfortunately targeted. The talented singer, however, didn’t succumb to the negativity and posted a strong statement defending herself against the haters. You go, girl! 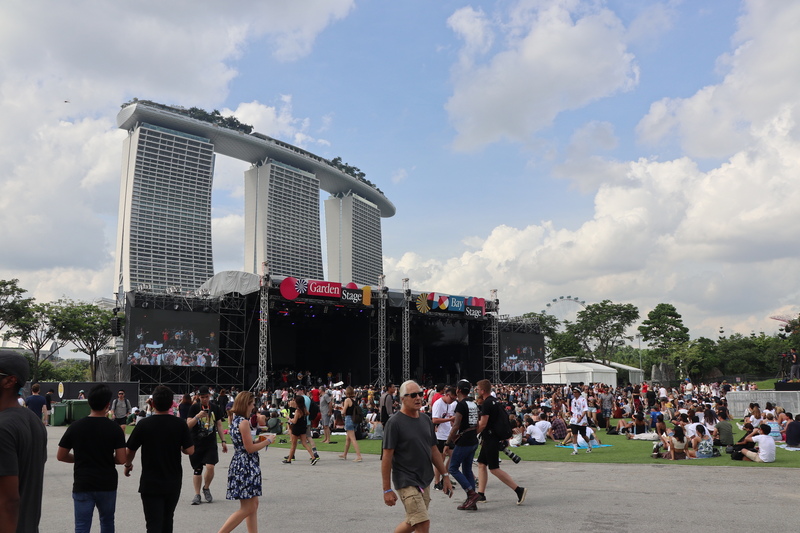 The skies cleared to make way for what was arguably the annual Laneway Festival’s most subdued, yet genre-bending line up of artists yet. We take you through the highlights of the event’s eighth edition on our shores. 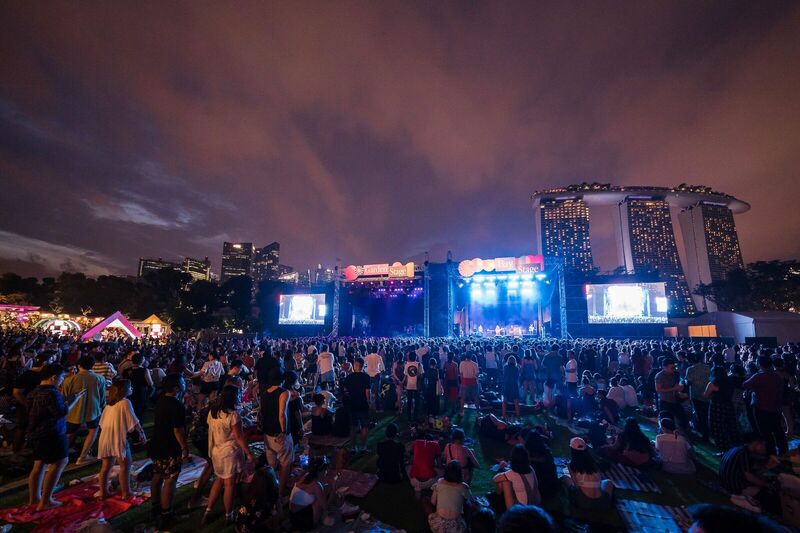 R&B and hip-hop reigned supreme at Laneway Festival Singapore 2018. 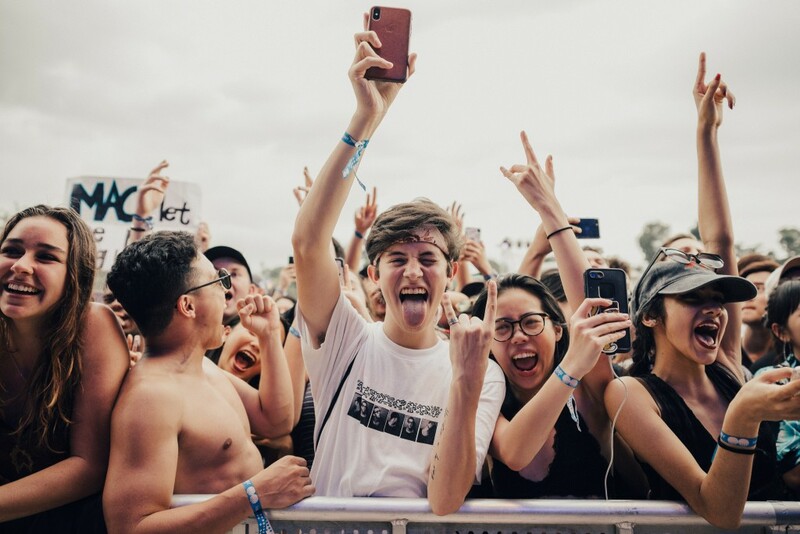 And it was a long time coming for ardent fans of the genres, considering Laneway’s previous focus on acts ranging from the hard-hitting Japandroids, electronic Flume to even mainstream radio-hitters The 1975. While this year still saw a mixed bag of rising indie names alongside industry veterans, it was acts like Loyle Carner, The Internet and Anderson .Paak that drew the loudest crowds with their hard beats and smooth jams. Even with a technical glitch right as Anderson .Paak took the stage threatened to put a damp in spirits, the rapper and his backing band The Free Nationals bounced back swiftly and launched into crowd favourites like ‘Heart Don’t Stand A Chance’ and ‘Am I Wrong’ off his stellar album Malibu. His on-stage comeback elicited cheers from many, who were clearly present to catch the buzz-worthy act. Besides the festival blessing the 10,000-strong turnout with non-stop tunes throughout the day, the weather was also surprisingly clear despite dark, looming clouds and a scatter of drizzle that passed as quickly as it came in the evening. Considering the wet weather conditions of both last year and the festival’s first inception – that many dubbed “Rainway” – the disposition of everyone were firmly kept as sunny as the skies with every other act performing without delays or a hitch. Earlier in the day, early birds who joined in the festivities since noon were rewarded with thrilling performances to set the day off on a right note. Australian songstress Amy Shark, fresh off her overwhelming acclaim in her home country, dazzled the crowd with her laid-back pop tunes. Regional pride was also represented, with Indonesian shoegaze outfit HEALS and Malaysia’s pop prodigy alextbh kickstarting things off across the various stages. Kudos to the organisers for also not segregating local acts to a designated stage and slotting them on the main stages as well, with Obedient Wives Club making their anticipated live comeback on the Garden Stage. Music’s next-big-thing Billie Eilish was met with the warmest reception from the younger audiences, as the predominantly teen attendees flocked to her set with their phones high up in the air. 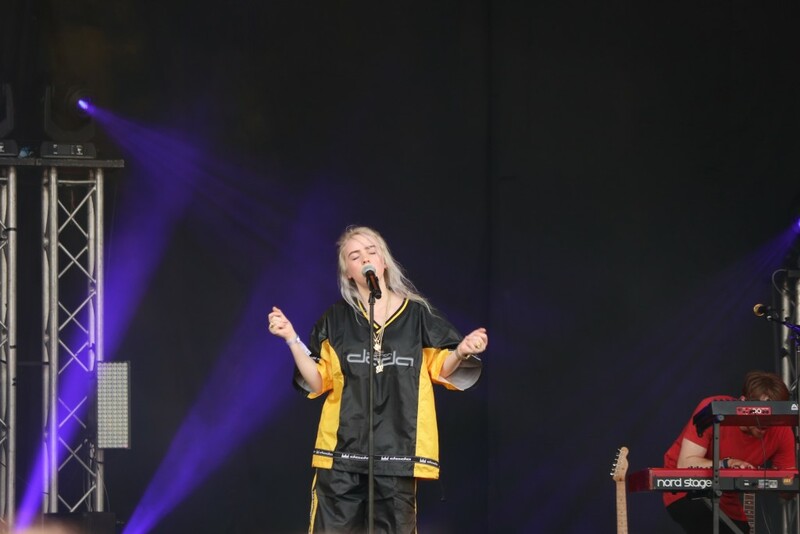 Decked in an oversized sports attire, the sharp-tongued wunderkind proved her mettle as an artist with her addictive tracks including Bellyache’ and ‘Ocean Eyes’. If it’s not enough a sign that bigger things are to come from the young talent, our previous interview with her will further prove that sentiment. What’s a music fest without other complementary highlights? Elsewhere, a visit to the H&M booth saw patrons scoring free makeup products by playing an interactive game. The Strongbow booth was decked out with beds to lie on while sipping on ciders. You could even craft your own fragrance at the Ooh La Lab pop-up space! We have a mini carnival going on for @hm this year! Stand a chance to win their beauty products by playing their activation games. But this year also saw reduced lines for F&B, thanks to the seamless incorporation of Uber Eats. A bevy of gastronomical fare lined the Uber Eats Village, which was fully decorated with Instagram-worthy structures and sufficient seating, and was only made better by having the option of ordering from a wide array of options from the phone, and having it delivered to one of three collection points. This dismissed the need for queuing and waiting around, which allowed for greater space in the food village and for many to enjoy the music until their food was notified to have arrived for collection. We’re all for new innovative ways that concert-goers experience a festival, especially when it’s one as effective as this! With Laneway’s steady evolution in terms of line-up picks, crowd service and accessibility to a fully immersive experience (did we mention there was a super cool Meet and Greet booth too? ), it’s safe to say that it’s proven its mainstay as the best festival that Singapore has to offer, and it doesn’t look like that’ll be changing any time soon. Bring on 2019! If you haven’t already caught up on all the KARD action on our socials, you’d have known that we’ve had an amazing time with the quartet during their trip to Singapore. From hanging out with ’em for a Facebook Live session, to partying it up with the rest of the Hidden KARDs for their Wild KARD Asia Tour, it was an absolute blast. And we can safely say, there’s plenty to love about the K-pop hit machine. Their addictive tunes and eclectic style aside, it’s their charming personalities and fresh dynamics that make them uniquely KARD – they’re known as “Korea Artistes Really Dangerously Full Of Swag” after all. Kicking off the show with their signature dancefloor bangers such as ‘You In Me’, ‘Don’t Recall’ and ‘Rumour’, B.M, J.seph, Somin and Jiwoo whipped the crowd into a frenzy with their swoon-worthy moves and killer stage presence. But it wasn’t long before they snapped back to their usual dorky selves, and unexpectedly… things got a little wild along the way. We recap our favourite moments of the night. It may be 2018, but KARD ain’t letting ‘Gashina’ die just yet. During the Q&A segment where they had to pick questions on post-its left by fans, Jiwoo selected one that requested for her to dance to Sunmi’s ‘Gashina’, but J.seph got the bait instead thanks to Jiwoo revealing that it’s one of his favourite songs. J.seph’s cover was undeniably adorable, but B.M wasn’t about to let it go without showing off his own rendition of the gun-point choreography, which caused the girls to explode in peals of laughter. As expected from our resident swag machine! What’s image when it comes to KARD? They had no qualms divulging even the most unglamourous of secrets to their fans, and they weren’t even lowkey about it – showing just how genuine and down-to-earth they are beyond their idol status. When asked about their favourite memory in Singapore, J.seph went on to talk about his experience riding the GX-5 extreme swing and admitted that he “almost pooped his pants” while on it. To which B.M didn’t hesitate to add on that he, too, “almost pissed his pants”. Err… TMI, guys! One of the questions was “If you could take a fan out on a date, what would you do?” and B.M responded that he’d like to bring them to tour the DSP studio and eat tteokbokki (spicy rice cakes) after because it’s Somin favourite food. Excitedly, the latter began to chant tteokbokki and the crowd obediently followed suit. Guess we’ve all converted to tteok enthusiasts because of Somin! Enough of the fun and games. KARD got back in action and did what they do best: slaying the stage. But this time, they got the floor all heated up with sizzling covers of Ariana Grande’s ‘Side To Side’ and Bruno Mars ‘24K Magic’ – in perfect pronunciation no less, despite 3/4 of them not being fluent in English. Seriously, what else can KARD not do? KARD always rolls like a well-oiled machine, but there’s no denying the individual appeal of the foursome as well. Each member had the chance to showcase their distinct charms during the solo stages – Jiwoo getting her groove on with Winner’s ‘Really Really’, Somin’s angelic vocals during Taeyeon’s ‘Fine’, B.M spitting rapid-fire verses in ‘Livin’ Good Pt.2′ and J.seph displaying his composing chops with a mid-tempo rap number – all while giving one another their utmost support. It doesn’t get anymore #SquadGoals than this! That’s not the end; we’ve got more KARD goodness in store for you guys, so be sure to keep a lookout ’cause things are about to get even wilder. Meanwhile, check out our hilarious interview with them and don’t forget to pick up a copy of our latest issue featuring KARD on the cover! “This is a huge place. We made it,” guitarist Toru bellowed into the mic while the audience erupted in thunderous cheers. Playing their biggest show yet on our stomping grounds as part of their Ambitions tour, ONE OK ROCK are one of the few Japanese hard rock acts capable of commanding a crowd large enough to fill the Singapore Indoor Stadium. A solid 6,500 fans turned up in full force, with the diehards all decked out in top-to-toe band merch and ready to rock. At a ONE OK ROCK concert, expect to get up on your feet as soon as you enter the venue (yes, even those who got themselves a seated ticket) ’cause you’re about to have a smashin’ time singing, jumping and headbanging along to every note right from the get-go – not that we mind. Leaping into the blistering opener of ‘Bombs Away’, the four-man powerhouse wasted no time in delivering banger after banger, led by larger-than-life frontman Taka as he rasped and snarled his way through the intense set. It’s hard not to be amazed by Taka’s flawless showmanship and contagious energy – the 29-year-old is one of the most charismatic performers we’ve ever seen, proving his prowess by effortlessly working the crowd and never once letting up. Taking a break from stadium-sized anthems, the arena rockers winded it down for a couple of slow-tempo numbers such as ‘Wherever You Are’ and ‘One Way Ticket’. It was a breathtaking sight to behold as the crowd illuminated the venue in a sea of red and blue lights, passionately crooning along to every single word. What stole the show for us, however, was when Taka launched into a soul-baring rendition of the 5 Seconds of Summer-assisted ‘Take What You Want’, showcasing a different side of the band’s musicality. There were also fan service moments when the lad snuck in some cheeky moves such as putting up a heart shape and amending the lyrics of ‘American Girls’ to ‘Singapore Girls’, which elicited a chorus of awws from the audience. Two hours whizzed past in an instant, and soon the guys were already saying their farewells – not forgetting the mandatory ritual of taking a video of the massive turnout for Instagram (see above). “[It’s the] last one for tonight,” Taka addressed the crowd. “I know, I have the same feeling as you but we will definitely be coming back, so please wait for us till the next time we arrive. See you soon.” You heard ’em! 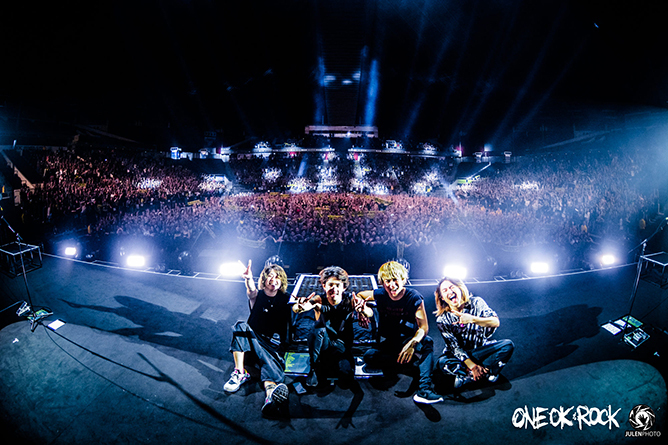 Can’t get enough of ONE OK ROCK? Check out our interview with the band where they shared their thoughts about their global appeal, breaking Asian stereotypes and more.